2012 February | Federation of North-American Explorers | Semper Parati! Each month at our meetings we’ll have a story of a saint and ask for their intercession on our behalf and that of our brothers and sisters around the world. This is a bit late getting up but January 31rst is the feast day of St. John Bosco. He was a saint who devoted every ounce of strength to helping youth to be strong in their faith. Did you know he was so strong that he could crack a walnut with his bare hands? He also had gifts of prophecy. He was a courageous and tireless defender of boys, protecting them from exploitation at the hands of industrialists, or those that would use them for political purposes. He gave all a home and care no matter where they came from or how many they were and among his spiritual children was St. Dominic Savio. 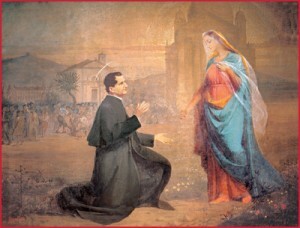 St. John Bosco pray for us!